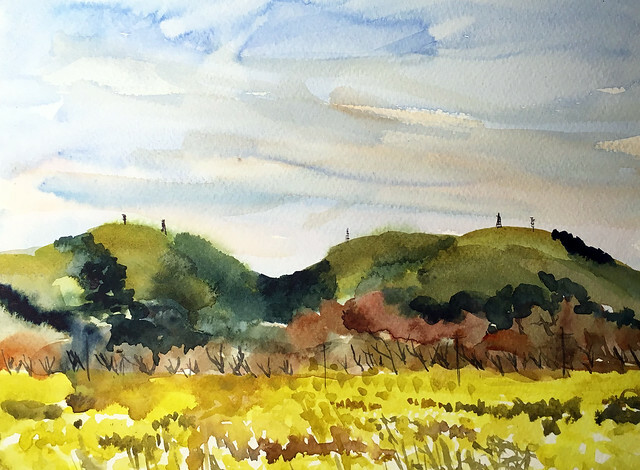 When I sketched this Morgan Hill, CA, field last October, it was filled with rows and rows of pumpkin vines. Yesterday it sported an acid yellow coat: wild mustard as far as the eye could see. Direct to watercolor, in Fabriano wirebound watercolor sketchbook. Not my favorite paper, as it doesn't love juicy washes ... but I'm on a self-imposed paper diet as I have too many UFSs (unfinished sketchbooks) on hand.